Here are a few Frequently Asked (and answered) Questions regarding the Third Generation Lexus IS (3IS). Simply click on the links to be taken to another thread with more details. The sections below cover introductory forum rules, links for potential buyers, DIY and FAQ links, lists of threads of common recurring and 'official' topics. Please scroll through and explore! Please note we'll be populating this FAQ as the new IS model is released, but want to start out with a sticky so members can add nominations over the first few months when you start to see recurring topics! Click here to be taken to our forum rules including important details regarding our work safe environment, guidelines against personal attacks, group buy rules and even details on what signature images are allowed (those pictures you see when members post at the bottom of their reply). Please take the time to read them as our forum rules are strictly enforced. If you aren't familiar with forum software, there is also general usage help on how to create and reply to threads, how to update your profile, etc at the end of the FAQ link. Please look through the FAQ before posting a question. This FAQ tries to capture the most common questions, but please also search before posting if you don't find it here. We're writing a new 'how to' on advanced search but you can get the idea in this post. I BOUGHT ONE! How do I get on the ClubLexus New IS Owner Registry? Our members have started "official" threads to share photos and details about many aspects of their 3nd gen IS including wheels, colors, etc. Now that you've explored the 3nd Gen IS forum, we want to make sure you knew about the rest of Club Lexus and took advantage of all it has to offer. Click the bolded text to visit the mentioned sub-forum. We've created a new classified advertisement forum specific for the 3IS and a gallery to host your 3IS images, free of charge! We have a dedicated Automotive Care & Detailing forum that is for discussions on washing, waxing, polishing, detailing, cleaning and maintaining the the beauty of your new Lexus. This forum is moderated by two professional detailers. Our Vendor Marketplace is the place to find group buys and great deals from ClubLexus' supporting vendors. The Wheels & Tires Forum is where you can ask all sorts of questions about aftermarket rim and tire combos. If you want to shoot the breeze about SOB (some other brand) of vehicle, try Car Chat or ask about something else in life try The Clubhouse. We have many local meets for Lexus enthusiasts, check out the forum for your area. and this is just a start... we wanted to make sure you took some time to poke around and discover the other areas of the forum that can enhance your Lexus ownership experience. Welcome to our community! 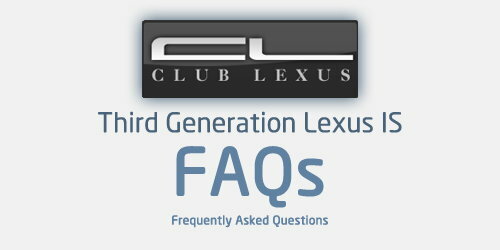 THANK YOU to all the Club Lexus moderators, editors and members that contributed to this FAQ and the linked content!